A Pacific Wren sings his heart out on an early spring day. It’s like magic when I hear the birds sing in the morning, which they’ve been doing since the beginning of March. Birds – and their hormones – react to light. The local birds, including robins, wrens, and chickadees, are ramping up for nesting season with their songs and calls. It’s been an exceedingly cold winter in much of the United States and across the northern hemisphere. Here comes the sun. 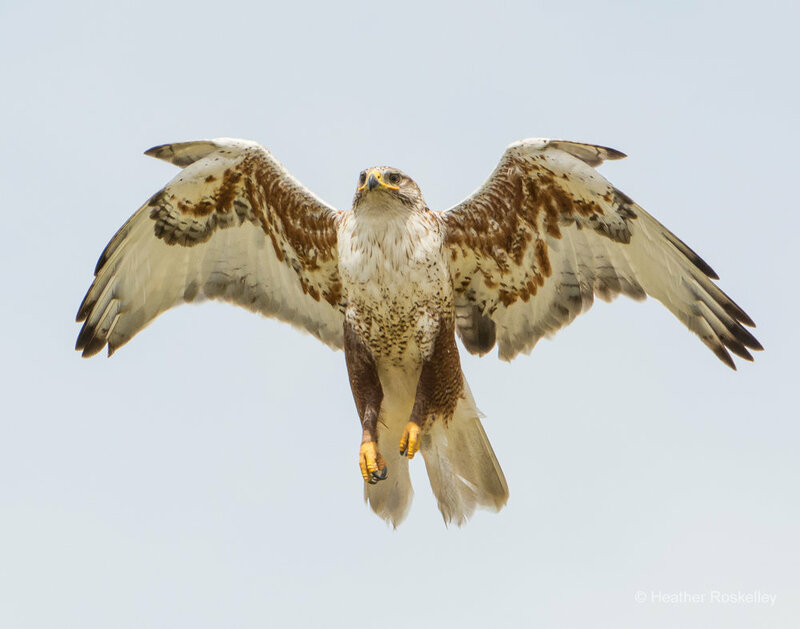 The magnificent Ferruginous Hawk is a short-distance migrator dependent on grasslands and open sagebrush country with an abundance of prairies dogs, rabbits, and other small mammals. Pondering why birds matter in his eloquent essay for National Geographic, the author Jonathan Franzen notes that birds "are our last, best connection to a natural world that is otherwise receding." This past weekend kicked off celebrations of the Year of the Dog and the Chinese New Year. But this year is also being recognized for another animal. 2018 is The Year of the Bird. National Geographic along with major conservation and wildlife organizations such as Audubon and Cornell Lab of Ornithology are providing stories and activities to mark the centennial year of the landmark Migratory Bird Treaty Act. Created in 1918 to combat the massive killing of birds for their plumes used in ladies’ hats, it was one of the earliest environmental laws enacted anywhere in the world. With climate change seemingly quickening its pace, and birds – animals that migrate some of the greatest distances in the world – serving as bellwethers across the Earth, it’s important now more than ever to take a reading of what the data is saying and to contemplate why birds matter. I’ve included a photo of one of my favorite raptors to go with this post. The magnificent Ferruginous Hawk is a short-distance migrator that I see on the dry, open plains and farmland of eastern Washington during the summer. They fly up from land south of Washington to raise their young. Seeing a pair of these pale hawks circle high above together in a bright, summer sky is a life-affirming moment for me. As with many birds, conservation of grasslands and sagebrush steppe environments is important for the continued health of this species. Sustainable ranching practices that conserve prairie dog towns are beneficial to this hawk, whereas the construction of pipelines, wind turbines, and mining can have detrimental effects. Information on birds and actions you can take to help them, including backyard bird counts and setting up feeders, can be found at the Year of the Bird website. 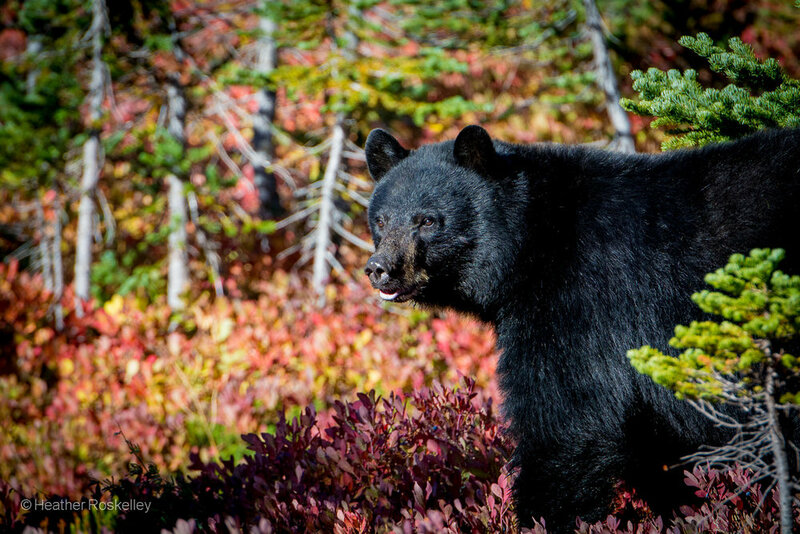 In preparation for hibernation, a Black Bear forages for food among blueberry bushes on the lower slopes of Mount Rainier. If he lived on a wildlife refuge in Alaska, he could be killed in his den while he slept. The first week of October was glorious on Mount Rainier with intense colors of red, orange, and gold covering the lower slopes. Just one week later, everything was covered in snow. I saw this beautiful Black Bear in the back woods of Reflection Lakes just before early snowfall came to the mountains. He was bingeing on berries and leaves from blueberry bushes that covered a large meadow, fattening up before winter hibernation. He is probably in his den now, deep in sleep. Thank goodness he doesn’t live on a wildlife refuge in Alaska. If he did, he might be killed as he slept. Or if this bear was a female and gave birth to cubs, they might all be killed. In April of this year, the Trump administration rolled back an Obama-era ban on killing hibernating bears on wildlife refuges in Alaska. Bears can also be tracked and shot from aircraft as well as baited and killed. The same applies to wolves and coyotes, who can be killed in their dens with their pups. Most people – including many hunters - would call these actions cruel and unsportsmanlike. I call these actions a violation of the rights and sanctity of nonhuman animals. As stewards of the Earth, we should be better than this. I’m thrilled and honored to announce that my Varied Thrush photo is one of the winners of the 2017 Audubon Photography Awards. The photos of four photographers were recognized and selected from over 5,500 photo entrants across the United States and Canada. Categories are Grand Prize, Professional, Amateur, and Youth. My photo won the Amateur Category. There are four Honorable Mentions recognized in each category as well. I wrote about this bird in a previous blog post on February 15, 2017. The Varied Thrush is one of my favorite songbirds because it is a beautifully colored bird with a haunting song found primarily in the Pacific Northwest. I took the photo in one of the loveliest places in the Puget Sound – Washington Park Arboretum in Seattle. You can view the Varied Thrush photo in my Songbirds Gallery. As with all of my gallery images, it is available for purchase as a fine art giclée print produced with archival inks on fine art paper. Simply click on the Purchase Print link and you will be taken through an easy purchase and checkout process. Murray, the father Peregrine Falcon, flies past a nearby office building in downtown Tacoma while searching for food for his chicks. Since May, I along with many other birders and office workers in downtown Tacoma have been captivated by a family of Peregrine Falcons who took up residence on one of the tall buildings. The mother Peregrine Falcon, Harriet, and two of her chicks at about 4 weeks old. Four white Peregrine Falcon chicks – called eyasses in falcon terminology – hatched in early May in a nest box near the top of the 16-story 1119 Pacific Avenue building. The chicks were banded soon after birth and given names through a contest sponsored by Tahoma Audubon. The three males were named Chris, Jake, and Eeyore, and the one female was named Hope. The father of the young falcons, Murray, was born and banded 13 years ago on Tacoma's Murray Morgan Bridge. His mate, Harriet, is an unbanded falcon, so her age and origins are unknown. Peregrine Falcon parents, Murray (top) and Harriet (bottom), keep a watchful eye on their four chicks. One can see in this photo the larger size of the mother - a trait common among most raptors called reversed sexual size dimorphism. Murray sitting on a pyramid at the top of the 1119 Pacific Avenue building, which gives him a good view of his chicks. This building was the tallest west of the Mississippi from 1911 until 1914. Perhaps Murray is envisioning himself to be the Egyptian falcon god, Horus. The Tacoma News Tribune featured an article about Tacoma’s falcon family accompanied by wonderful close-up photos taken by Fergus Hyke, a local falcon volunteer and photographer who happens to work in the building. Harriet flying near the nest box and chicks. Maybe because they live in an “urban canyon” of tall buildings with narrow ledges, unpredictable wind gusts, and windows that reflect and confuse, the development of these birds throughout the month of June was filled with much drama and even death. This drama is not unique to Tacoma. It plays out in major cities throughout the world, as there is usually a Peregrine Falcon pair that takes up residence in many cities due to the semblance of high buildings to cliffs and a surplus of their favorite prey – pigeons. They will also attack starlings, ducks, and other birds. Harriet carrying the remains of a pigeon to her chicks. I didn’t realize how quickly Peregrines and other raptors develop. When I saw them for the first time on May 29, they were white downy chicks. In just a week, they had dark feathers growing through the down and were much larger in size. Within just 6 weeks after hatching, they were flying. Harriet feeding her chicks, which are nearly 5 weeks old in this photo. They changed greatly in just 6 days from the previous photo. Murray (left) and a chick call to Harriet as she flies up to them. Fledging is a very difficult process for young raptors, especially when there are buildings to negotiate and windows to decipher and avoid. Unfortunately, one of the chicks – Chris - flew into a building and died. Both Jake and Eeyore had accidents as well. And then Hope hit a window. She was taken to a wildlife rehab center and placed back on the ledge a few days later. While her two brothers have become flying machines, Hope is apparently still hurt and unable to fly very well, so her future is uncertain. One of the male chicks, Jake, trying out his new flying skills. He's nearly 6 weeks old in this photo. Only about 30% - 40% of young falcons live through their first year even in natural surroundings, so it’s not surprising – but no less heart-breaking - when one of them dies. Sometime probably in July or early August, the family will disperse and the young falcons will find their own ranges. Murray and Harriet will hopefully be back at the same site in January or February, starting the cycle over again and raising a new family of falcons. Next time there might even be a webcam. A newly arrived Swainson's Thrush takes in its surroundings, including a human with a big camera. Every year I marvel that some of the birds I’m seeing traveled thousands of miles just to be here for the summer to raise their young. This inconspicuous little bird with its subtle coloration is the Swainson’s Thrush – a tropical cousin of the American Robin. They’re very shy and hard to get a good look at most of the time. This one had probably just arrived and was trying to get its bearings. Is this human with a big dark eye a threat? Are there other dangers lurking nearby? Will this forest be my home for the summer? The Swainson’s Thrush travels from as far away as the foothills of the Andes in South America – over 5,000 miles away – flying mostly at night. What a perilous and exhausting journey. What a miracle. The flute-like, upward spiraling song of the Swainson’s Thrush provides a sound track to many forests in North America. When they first arrive in early May, one can hear their “whit” call. Their song can be heard within a week or so after arriving when they’re establishing territory and attracting a mate. There are feathered visitors all around us now. They’re here for only a few months. Welcome birds, one and all. A downy black chick emerged from beneath the Virginia Rail mom. It’s Mother’s Day and a time to celebrate moms of all kinds - including those with feathers. I was fortunate recently to see a mom with three babies that are a rare sight in the bird world. While walking down a path in a local wetland area, I spotted what looked like a rabbit sitting quietly at the side of the trail. I looked through my binoculars and saw that this bunny had a beak, and, amazingly, was a not a rabbit but a Virginia Rail. Was it sick, I wondered? To see this shy, secretive bird sitting in the open away from the protective cattails of the pond didn’t seem right. All of a sudden, however, the rail stood up and I noticed a black puffball emerge – and then slowly, two others joined the mom and sibling from the nearby vegetation. Virginia Rail mom and baby. Two other chicks emerged to join their mother and sibling. Two chicks are under the mother Virginia Rail with the third also seeking cover. The three chicks are completely hidden under mom. She didn’t seem afraid of me, but two people were coming down the path talking loudly and this scared her. She ran across the path to the other side, leaving her little ones to scramble into the bushes behind them. The three Virginia Rail chicks wondered where mom went, but she quickly came back for them. I worried that they would be separated, but after the couple left, I heard her doing her grunt call back on the side with the chicks. To my amazement, they all came out again and I was able to photograph them. Finally, for some reason, she really wanted to lead them to the other side of the path, so she darted across and the little balls of down made an attempt to follow, peeping all the way. They finally made it across and I could hear her talking to them as they moved away sight unseen in the dense underbrush. The three Virginia Rail chicks with their mom. Mom finds a tasty slug for one of the lucky chicks. This photo shows the large size of Virginia Rail feet - perfect for traversing marsh vegetation. The Virginia Rail family continues on their journey. Some of the vegetation is taller than the chicks, making it hard for them to keep up with mom. Another view of the Virginia Rail family as they make their way through the grass. I thought about all the dangers these chicks will face from predators – river otters, weasels, coyotes, and even other birds like Great Blue Herons. Since Virginia Rails can have up to 13 eggs, perhaps some of the siblings were already eaten and this was a reason the mother led them away from the pond. I wished the little family luck, grateful that our paths had crossed. One of my last views of the Virginia Rail mom and chicks. I wished them well as they disappeared across the path into the underbrush. All seven Sandhill Cranes gazing upwards. I visited Billy Frank Jr. Nisqually NWR on Friday hoping to catch a glimpse of the new Great Horned Owl babies and to simply enjoy a sunny day at one of my favorite places. The great thing about a place like Nisqually is you never know what you’ll see. I was walking on the fabulous boardwalk that crosses the estuary and saw a couple of photographers focused on something on the tidal flats. “Did you see the Sandhill Cranes?” one asked me. No, I replied. And honestly, I might not have noticed them because they were backlit and looked like some of the remains of trees dotting the mud. An adult Sandhill Crane with two young cranes. What a treat. Seven of them – possibly five adults and two young cranes. They’re rare visitors to Nisqually, and it appears that these alighted only for a brief time. A master birder who frequents Nisqually told me that they usually make a "one day wonder visit" once or twice a year. The accompanying photos were taken in terrible light and rather far away, but it’s interesting to note in one how they're all looking up. I’m not sure if it was simply due to the gulls circling overhead or if they caught sight of one of the Bald Eagles making a hunting foray. Another photo shows one adult with two young cranes. Sandhill Cranes can be seen in the thousands in certain areas of the United States during the winter including Bosque del Apache, New Mexico, and Anahuac National Wildlife Refuge, Texas. Thousands also make a stopover near the Platte River in Nebraska during spring migration. The greatest number in Washington State can be seen in March and April near Othello. Although the cranes were signaling that they might be preparing for flight, i.e., lifting their heads up, flapping their wings, and generally facing the same direction, it was hard to tell if they would actually fly and I got distracted by a Greater Yellowlegs. After a few minutes, I looked up and saw all seven in the air. They flew in a line with a leader and then arranged themselves in a row, flying wing tip to wing tip. They were probably heading north to Canada or possibly even Alaska to their nesting grounds, part of the great spring migration. My last view of the Sandhill Cranes as they flew north side by side to their nesting grounds. Recently, on a rare perfect spring day in Seattle, I visited Washington Park Arboretum. The camellias, cherry trees, and magnolias were all in peak bloom, so there was a profusion of pink and white blossoms everywhere. As an intrepid bird photographer, I was hoping that one of the Townsend’s Warblers I spied in the conifers would oblige and pose among these beautiful blooms. It was not to be. From a vista above the lower gardens, however, I looked down to Azalea Way and saw a beautiful dancer being photographed among the cherry trees. I quickly made my way down the hill. Dressed in sapphire blue with long, thick braids and swirling against a backdrop of pink trees, she looked like something out of a fairy tale. I couldn’t help myself – I had to photograph her. I’m not as comfortable photographing people, but I managed to get some nice shots – especially since the sky was hazy and created a natural softbox effect – perfect for people and flowers. I found out afterwards that she is an Armenian professional dancer with her own studio in Kirkland. Karina Melikyan is the founder and director of Karin Kirkland School of Dance. She was being photographed in honor of receiving the gift of a dance from a respected choreographer. It is Easter, and there is an interesting connection. I learned that Armenia was the first country to officially recognize Christianity back in 301 AD. Karina was raised by a Muslim mother in Christian Armenia, so she said in an email that it “made her grow tolerant and respectful of other religions and cultures.” She has taught Armenian dance in Syria, and she danced Russian-style ballet professionally back in Armenia. There is so much beauty in the world. One never knows when they will happen upon it. Armenian dancer Karina Melikyan in Seattle's Washington Park Arboretum. I recently read that the old TV series Twin Peaks will be revived in 2017 on Showtime with most of the original cast members from 1990 and 1991. This cult TV show put the Pacific Northwest on the map as a place of mystery, weirdness, lots of trees, and pie. (The site of the Double-R Diner is Twede’s Café in North Bend – where you can still get a slice of cherry pie and “a damn fine cup of coffee.”) The maestro of strange and co-creator of both the old and new series – David Lynch – will again be directing. What does Twin Peaks have to do with the Varied Thrush? When I looked at the opening credits of the old series on YouTube, there it was – a bird found primarily in the forests of the Pacific Northwest up through British Columbia and Alaska. It’s a shy bird – not like its cousin the American Robin – and not one that is commonly seen. Whoever created the intro must have known something about birds and specifically selected one that could almost be considered emblematic of the Pacific Northwest and our moist and mossy coniferous forests. Varied Thrushes breed in the dense, mature forests of the Pacific Northwest, but in fall and winter many move into our residential areas, gardens, and parks. I always look forward to seeing them in October. I think robins are beautiful birds, but the male Varied Thrush is even more striking with its orange and blue-gray coloration, accented with a black eye mask and “V” on its breast. One of my favorite places to photograph them is a grove of mountain ashes (Sorbus) in Seattle's Washington Park Arboretum. The Sorbus collection includes trees from as far away as China with berries of pink, red, orange, yellow, and white. I’ve learned that when the berries and leaves are at their peak coloration in November, the birds aren’t interested. Mid-December through early January seems to be when the berries are perfectly fermented and ripe for eating. Three thrushes – Varied Thrush, American Robin, and Hermit Thrush – can sometimes be found in the grove if one of the resident Cooper’s Hawks doesn’t scare them away. Varied Thrushes can be difficult to photograph close-up because of their shyness. Most of the time they seem to prefer the tops of trees or hidden on the back branches. On this day, I was able to photograph one at eye-level. He was enjoying the beautiful white berries of Sorbus forrestii, a mountain ash from China. Most of the mountain ash berries are probably gone now, and with them, opportunities to witness one of the scenes of winter that I love so much in the Pacific Northwest. Varied Thrush and the mountain ash Sorbus forrestii. On a day filled with much rancor and noise, November 8, 2016, I quietly launched my new website. It felt good to be doing this, a positive action that might send a little more beauty and love into the world. My hope is that in a world fraught with division, we can agree that the Earth is important to us all. Clean, flowing rivers and streams; unpolluted oceans; pristine lands where harmony and natural order prevail. And respect and dignity given to all human and nonhuman inhabitants. With my website I send out love and peace to all inhabitants of Earth. A long-eared Owl takes flight. Frozen Lake is a popular stopping point for many hikers on the Sunrise side of Mount Rainier. I was talking with some fellow hikers at this spot in mid-July when a bear suddenly appeared over the rise. She caused quite a stir as she walked calmly near us, unperturbed by the humans gawking and taking cell phone pictures of her. She was a bear with a purpose, striding along the Wonderland Trail at a fast clip. I followed her, breaking into a jog at times to keep up. I kept my distance, and if I would have sensed irritation on her part, I would not have followed. But she didn’t seem to care. I noticed two hikers coming up the trail. They did the correct thing and moved off, shouting “bear!” repeatedly and loudly. Cinnamon Bear moved off the trail but hardly skipped a beat with her long strides. She finally went off trail over snow, so I stopped the pursuit. I found out a few weeks later from a ranger that she’s a regular visitor. She’s a Black Bear with reddish-brown fur, which is called a cinnamon bear. I love this term. Prior to my encounter, I thought this only described a gummy candy in the shape of a bear. Cinnamon Bear had cubs in past years, but not this year. It sounds like an every-other-year situation when it comes to young. I learned another thing – bears like to use our hiking trails. So if you’re alone and not sure if a bear might be around, sing or make noise or wear a bear bell so they know you’re coming. Black Bears are usually not hostile, but you don’t want to surprise a mother with cubs. I hope to see Cinnamon Bear with new cubs next year. I’ll keep my distance, however, and I probably won’t be following her.